Why does Ford have too many crossover/SUV offerings? It is not a complaint, but rather a curiosity. After a banner year for the brand, Ford retains a wide range of crossover/SUV offerings from the popular Escape to the big Expedition. In the middle is the Ford Flex – perhaps the forgotten member of this lineup. How so? There is a reason for the Flex’s existence. Originally, the Flex was intended to replace Ford’s minivan product, the Freestar. Instead, Ford put the wagon-esque crossover on the same platform as the Ford Taurus, which provided more interior space for a true three-row configuration. The Flex shares the same platform as the Lincoln MKT. The Flex itself is a throwback with modern styling. Think Scion-esque or Honda-esque boxiness that harkens back to your childhood. If you closely examine the scalloped side lines and on the tailgate, you might think they are a paean to the wood-sided wagons of the past. In particular, the Flex truly honors the king of all family transporters was the Ford LTD Country Squire. Take a huge LTD and affix a long enclosed rear end. Slap some fake wood on the sides and back you have the envy of all aspiring families. The Flex will remind you of a Country Squire for today’s discriminating family. It has seven seats that fold for a plethora of cargo and seating options. If I listed the options I came up with, your bandwidth would begin to slow down a bit. I will say how much I was impressed with the depth the cargo area behind the third row seats, when in the “up” position and when the third row was down, giving a flat run right at tailgate height. Behind the wheel is a huge cabin with a spacious area for the driver and front passenger. It also helps to have the Flex on a more Earthbound plane for entering and exiting the vehicle. The lower perspective of the vehicle helps in commanding it with the instrument panel at the right height. Under the hood is Ford’s regular 3.5liter V6. With 284 horsepower on tap, this V6 pulls over 4,600 pounds of three-row crossover with ease. This engine is connected to Ford’s smooth shifting six-speed automatic. It motivated quite nicely in traffic and around town and out on the highway. The Flex felt nimbler than its platform partner, the Explorer, and the Fusion-based Edge. How nimble? It is soft and smooth, but will let you feel the bumps on the road. Handling was quite competent, though you felt the leans in the curves when pushed. The steering was fine, considering the size of the Flex, yet on-center feel was vague and a bit loose. Lastly, the brakes work quite well with this paean to the station wagon. It also helped to have a blind spot monitoring system with cross-traffic alert and park assist on board to keep you safe. 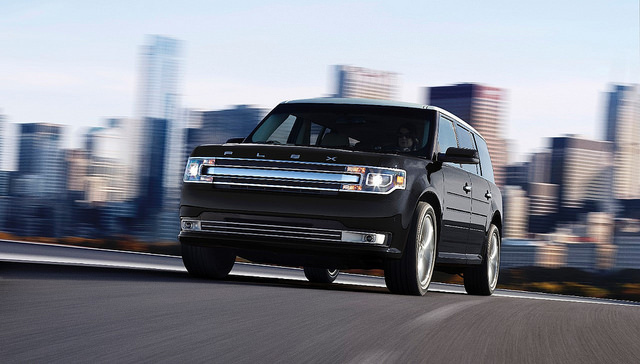 The most important piece of the Flex is its optional all-wheel drive system. This driveline works superbly by keeping all four wheels planted on the road. You could also thank the all-season nineteen-inch Hankook Optimos providing rubber to the road – and the frozen snow/ice. As for the economy loop, there are no surprises given the class it resides in. The Flex turned an 18.5MPG loop, about what one would expect its brother, the Ford Taurus, to turn these days. Flex prices start at $29,910 for a front-drive SE model. The Limited model tested came out to $40,840. You could add the turbocharged 3.5litre V6 EcoBoost engine to create a quick three-row crossover without drawing attention to itself. A fully loaded Flex with the EcoBoost option would ring the registers at $46,350. Why should you not overlook the Flex anymore? There are plenty of choices in this segment. If you must choose, the Ford Flex is a charming idea. Just think back when you rode in the rear-facing third row of your family’s station wagon – except you’re the one saying “Don’t make me stop this car” to the kids. That is what the Flex is really made for – bringing back the big old station wagon.